Ing lagiu nang Ima na Hannah Ayscough ya. Ing kayang kapitnang pangunakan a babai iyapin i Catherine Barton. 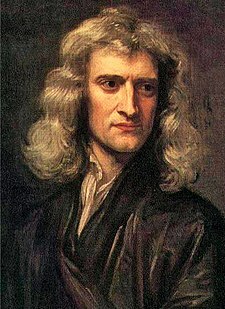 I Sir Isaac Newton FRS (4 Eneru 1643 – 31 Marsu 1727 [OS: 25 Disiembri 1642 – 20 Marsu 1727]) metung yang Inglaterru physicist, mathematicu, astronomer, natural philosopu, alchemist, ampong theologian nung nu ing panakit da ampong kikilalanan kareng dakal a matenakan ampong deng malda bilang metung kareng maimpluwensiang tau keng amlat. Ing kayang 1687 pangabulaglag ning Philosophiæ Naturalis Principia Mathematica (keraklan mayayaus a Principia) metung yang kikilalanan dang mainpluwensiyang aklat keng amlat ning science, memie talatag keng keraklan da reng classical mechanics. Ining kayang obra, i Newton pepasiag na ing universal gravitation ampo ring atlung laws of motion nung nu iti ing megbabo kareng scientific lawe da keng physical universe kaibat ning tutuking atlung dilanua (siglu). I Newton pepakit na deng galo da reng bage keng Yatu ampo ding celestial bage mangasiwa la kareng parepareung salansan da reng natural a batas kapamilatan ning pepakit na pane ing pamiugne ning Kepler's laws of planetary motion ampo ning kayang theoriang pami-igut (gravitation), inya leko na iti ing pamikakunu tungkul keng heliocentrism ampong sinulong na ing scientific revolution. ↑ Westfall, Richard S.  (1983). "Never at Rest: A Biography of Isaac Newton. Cambridge: Cambridge University Press, 530–1. ↑ Snobelen, Stephen D. (1999). "Isaac Newton, heretic: the strategies of a Nicodemite" (PDF). British Journal for the History of Science 32: 381–419. doi:10.1017/S0007087499003751. Archived from the original. You must specify the date the archive was made using the |archivedate= parameter. http://www.isaac-newton.org/heretic.pdf. Craig, John (1958). "Isaac Newton – Crime Investigator". Nature 182: 149. doi:10.1038/182149a0. Craig, John (1963). "Isaac Newton and the Counterfeiters". Notes and Records of the Royal Society of London 18: 136. doi:10.1098/rsnr.1963.0017. Bechler, Zev (1991). Newton's Physics and the Conceptual Structure of the Scientific Revolution. Springer. ISBN 0792310543. .
Casini, P. (1988). "Newton's Principia and the Philosophers of the Enlightenment". Notes and Records of the Royal Society of London 42 (1): 35–52. doi:10.1098/rsnr.1988.0006. ISSN 0035–9149. Archived from the original. You must specify the date the archive was made using the |archivedate= parameter. http://links.jstor.org/sici?sici=0035-9149%28198801%2942%3A1%3C35%3AN%27ATPO%3E2.0.CO%3B2-H.
Dobbs, B. J. T. (1975). The Foundations of Newton's Alchemy or "The Hunting of the Greene Lyon". Cambridge University Press. Halley, E. (1687). "Review of Newton's Principia". Philosophical Transactions 186: 291 – 297. Keynes, John Maynard (1963). Essays in Biography. W. W. Norton & Co. ISBN 0-393-00189-X. Keynes took a close interest in Newton and owned many of Newton's private papers. Shamos, Morris H. (1959). Great Experiments in Physics. New York: Henry Holt and Company, Inc..
O'Connor, John J.; Robertson, Edmund F., "Isaac Newton", MacTutor History of Mathematics archive, University of St Andrews .